So far thewebfactors has created 9 blog entries. Lack of Skill or Lack of Will? 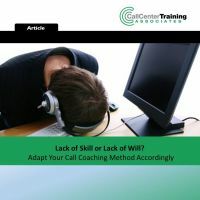 Adapt Your Call Coaching Method Accordingly! We are pleased to announce that industry pioneer Maggie Klenke has joined the teaching and consulting staff of Call Center Training Associates and will be teaching programs for Call Center University.